Happy Friday! Today I have a quick card to share with you. 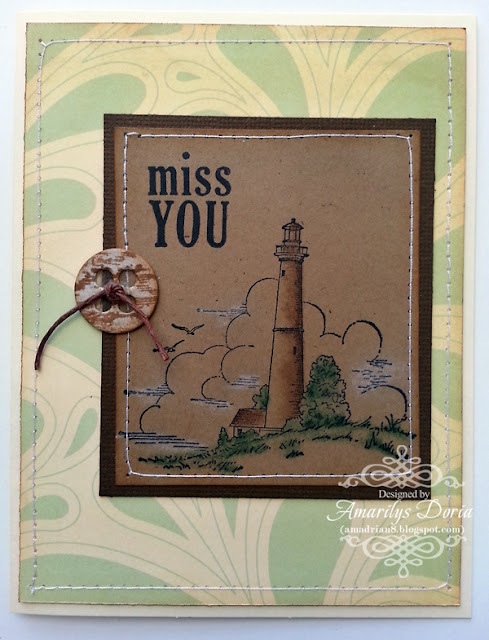 I made this card for the OWH Our Daily Bread Designs June Challenge. The challenge this month is to make a 'water' card. 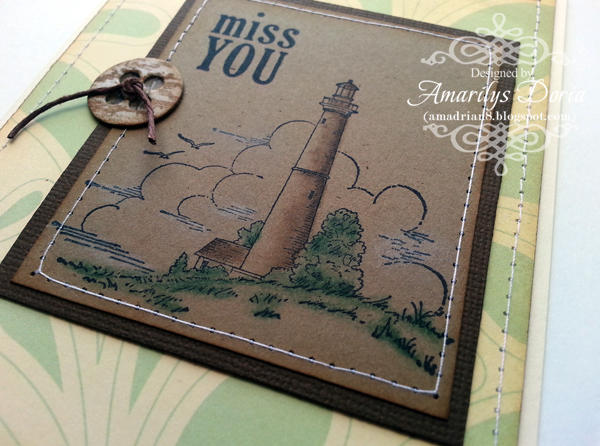 I used the Lighthouse image from Heartfelt Creations's High Seas PreCut Set from the Balmy Breeze Collection. This collection is simply AMAZING and perfect for masculine, and of course, water cards (and layouts!). I always use a cream color cardstock as my base so that I don't have to line the inside. I inked the edges and machine stitched the raindrop pattern paper and adhered to the background. I then stamped my image on kraft cardstock and lightly added some color with my Prismacolor pencils. I matted and machine stitch this layer as well. I made a little chipboard button, stamped a wooden image over it, inked the edges and added it to the left side of the image. I finished it off with a little tied knot. Thanks for stopping by my blog today! If you have never heard of Operation Write Home, please stop by their page today and check them out! They collect handmade cards from crafters around the country and send them to our heroes (Army, Navy, Marines, etc) overseas for them to send to their loved ones back home.